Blistex Raspberry Lemonade Blast moisturizes, protects and refreshes lips with a smooth-gliding formula and a tantalizing flavor. It's as delicious as it is effective. 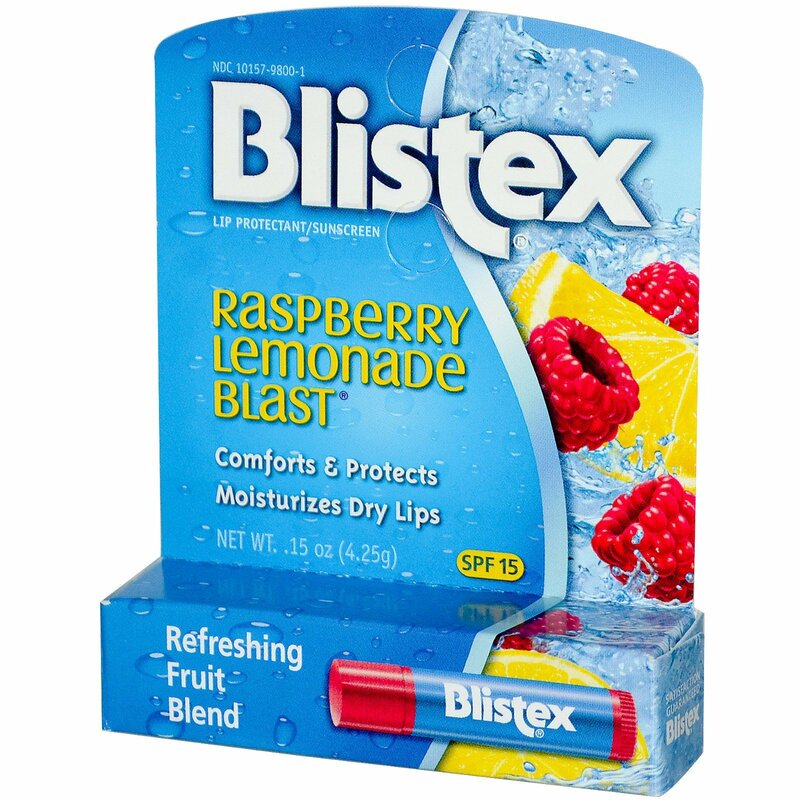 Moisturization & Flavor Sensation: Raspberry Lemonade Blast is fortified with anti-oxidant vitamin C & E and rich moisturizers to quench and protect your lips. A mouthwatering fruit blend delivers an explosion of juicy flavor. 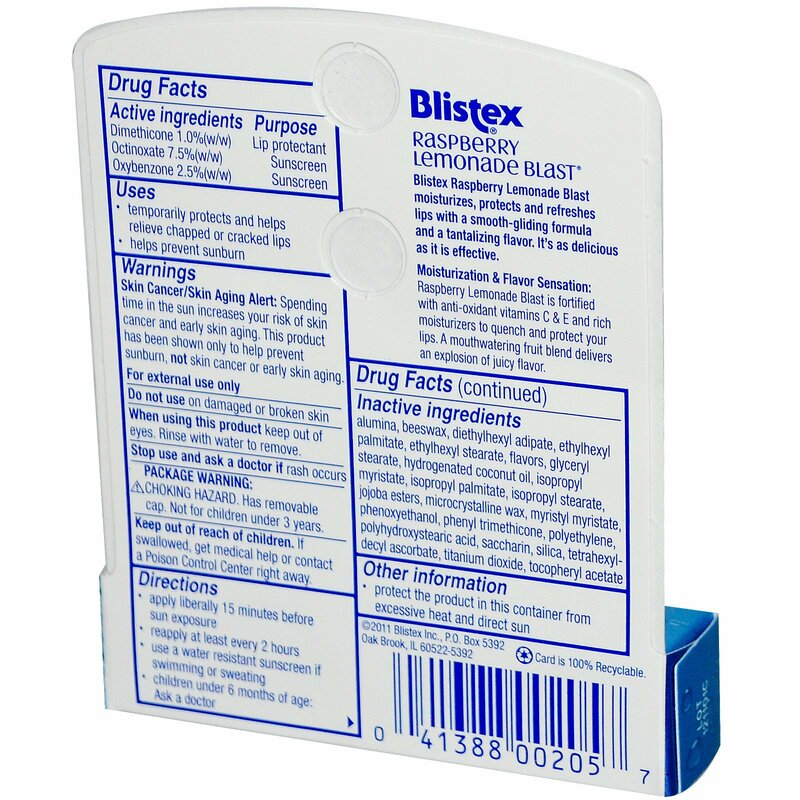 Inactive Ingredients: alumina, beeswax, diethylhexyl adipate, ethylhexyl palmitate, ethylhexyl stearate, flavors, glyceryl stearate, hydrogenated coconut oil, isopropyl myristate, isopropyl palmlitate, isopropyl stearate, jojoba esters, microcrystalline wax, myristyl myristate, phenoxyethanol, phenyl trimethicone, polyethylene, polyhydroxystearic acid, saccharin, silica, tetrahexyldecyl ascorbate, titanium dioxide, tocopheryl acetate.